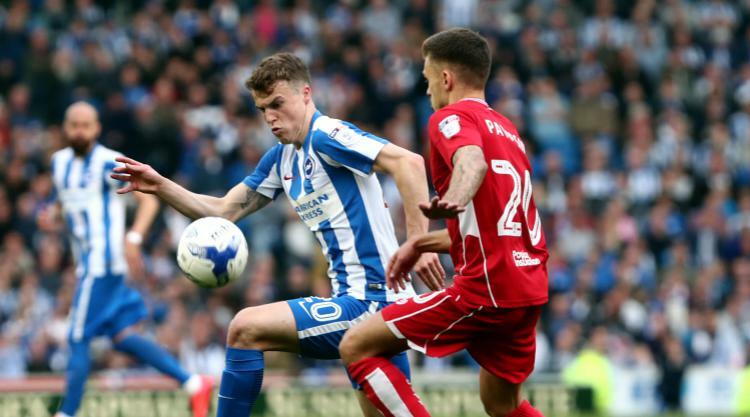 Brighton boss Chris Hughton has challenged Lewis Dunk and Solly March to prove they deserve a place in the England squad after they were overlooked by manager Gareth Southgate on Thursday. Dunk, 25, and March, 23, have earned plaudits following Brighton's impressive start to the Premier League season. But despite Southgate naming a trio of uncapped players for England's international friendlies against Germany and Brazil later this month, Dunk and March failed to be among them. Hughton however, has called on the duo to maintain their impressive form in a bid to show Southgate that they warrant a call-up. "For anybody who aspires to be involved at international level, it's about how they do at club level first," Hughton said. "The challenge for them is to perform at a level that enables their club to do well enough in the division and recognition comes from there. "Gareth Southgate has got a very difficult job to do. I've seen those that are included in the squad and they're young players that have come through the system and done very well. "We have players that have certainly developed really well in my time here and that's the challenge to all of them." Brighton, 12th in the Premier League, head to troubled Swansea on Saturday with just one defeat from their last five fixtures. Lining up for the Swans will be on-loan Chelsea forward Tammy Abraham, who Hughton courted last summer. Abraham, who has scored five times in 13 outings for Swansea, was named in Southgate's latest England squad, but Hughton insists he is not disappointed to have missed out on the forward's signature. "We did have an interest in him but these things happen," Hughton added. "It's not frustrating. We were not the only club that had an interest in him. "What you do want to see is young players doing well, although we don't particularly want to see him doing well on Saturday. "He's had an opportunity, played games, and obviously shown enough to get a first call-up. Credit to him."